Question:I have an application in which I require to open a PDF file. I don't want to open it with any application installed in Android phone. So, if there is no application installed in my phone which handles PDF files, my PDF file should open anyway. I searched a lot of links but I didn't find anything like the above. Is there any one who have a knowledge on that point? Is there a solution on VeryPDF? Answer: According to your needs, maybe you can have a free trial of this software, VeryPDF Free Online Document Viewer, by which you can view PDF, DOC, DOCX, XLS, XLSX, PPT, PPTX, HTM, HTML, TXT, RTF, HTM, HTML, GIF, JPEG, JPG, PNG, TIF, TIFF documents in Flash Paper Viewer & HTML5 Paper Viewer. When you output PDF file in HTML5 Paper Viewer then you can view PDF without any application installed like PDF reader or others on small device like iPhone, Android phone and others. But when you use this software, your small device could be open URL as this software show PDF files in the format of online files. Please know more information of this software on homepage, now let us check an demo here. The above snapshot is from one demo file in PDF viewer. You can open a PDF file by any computer without any PDF reader installed. Here you can check all pages or brief content in the left thumbnail part. On the top, you can adjust automatic zoom rate according the to font size in PDF file. By this PDF viewer, you can turn pages easily, show it in full screen, or snapshot, download it to your computer. In a word, this viewer can satisfy most of the reading PDF need. In the following part, let us check how to use this free online PDF viewer. Please open website of Free Online Document Viewer then you will see the following snapshot. All the steps have been marked clearly. 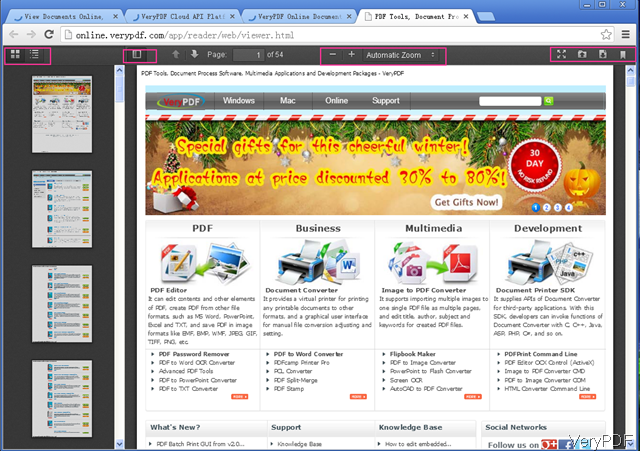 First, you can upload the local PDF file or online PDF file. Second, input the API key if you have. By the API code you can view the PDF forever. If you do not have, this software will keep it online in 24 hours. Third, click button Upload and Converter. Then you can view PDF easily by the URL at any place no matter computer or Android phone. In the newly bounced page, you can get PDF URL and the embed code. By the embed code, you can embed this PDF file at any website, blog. By the URL, you can view PDF at any browser without any PDF reader installed. By this method, you can view PDF at any place without any PDF reader installed. During the using, if you have any question, please contact us as soon as possible. Is there an API for Windows 8 “Modern reader” PDF Viewer? How to embed PDF in website and control view toolbar options? How to view PDF as a slideshows? Android, how to get PDF thumbnail images in application? This entry was posted in VeryPDF Cloud API and tagged view PDF. Bookmark the permalink.